Being in your 20s isn’t all it’s cracked up to be. Broke, out of college and floundering, Calvin Moretti decides to follow the current trend and move back home with his parents. Kris D’Agostino’s debut novel takes an authentic, funny, yet moving look, at what it means to reach adulthood during shaky times. In the old days of just 10 years ago, kids graduated high school and left home to go to college or get a job and become adults. Calvin Moretti is one of the new generation of 20-somethings who have added a step, before becoming independent — moving back home to live with their parents. Calvin’s not lazy, he just hasn’t found the path that sparks his interest. And, truth be told, life at the Moretti house doesn’t sound too bad. There’s plenty of love and laughter… well, sometimes. 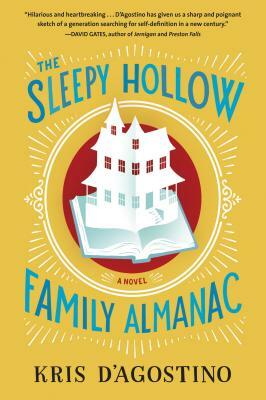 Kris D’Agostino’s The Sleepy Hollow Family Almanac is a story about a family that has been bombarded with one too many modern-day woes: Calvin’s father is recovering from cancer and waiting to see if the FAA will allow him to return to work as a pilot, his teenage sister is pregnant and decides to keep the baby, and his mother wants to downsize houses before they go bankrupt. D’Agostino approaches life in the 21st century with humor and sensitivity — giving us hope that ordinary families can together find the strength to break a new trail, when the old one loses promise. As Calvin reflects while visiting his father in the hospital, “Sometimes, being present is enough, and if nothing else, we are here. All of us.” The Sleepy Hollow Family Almanac is a must read for everyone who has ever felt, even momentarily, lost.